If you sailed this weekend, you enjoyed another spectacular weekend of fall sailing on the Bay. 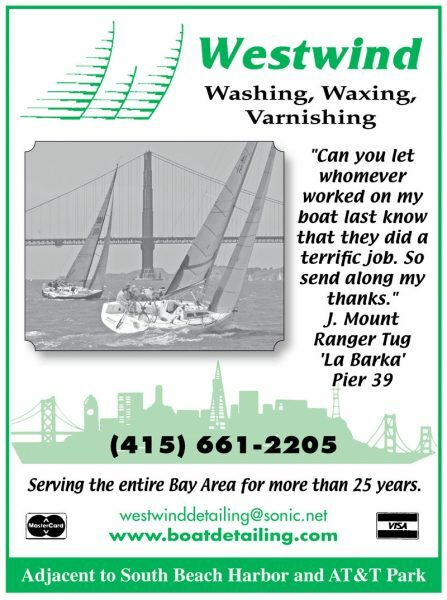 And if you sailed in Saturday’s Perkins Cup or Sunday’s Leukemia Cup Regatta, bonus! You were one of the many sailors contributing to the San Francisco Bay Leukemia & Lymphoma Society. 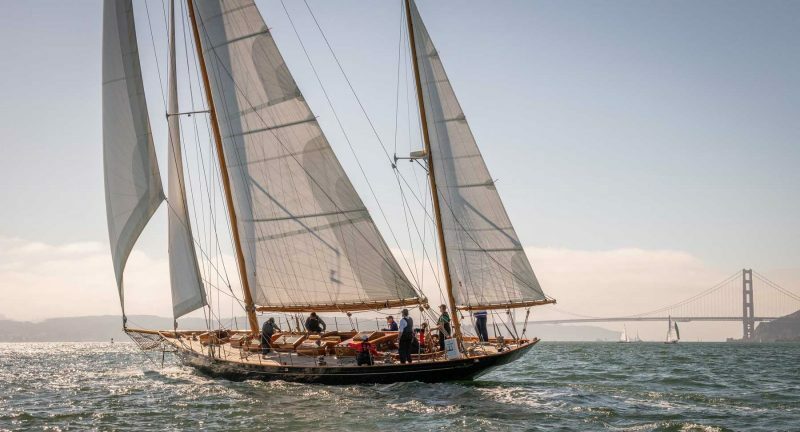 It can be a sketchy proposition to pull off a race this time of year as the classic Bay sailing breezes shift to winter mode, but, once again, the breeze came through and so did Bay Area racers who took up the challenge to raise money to battle cancer. 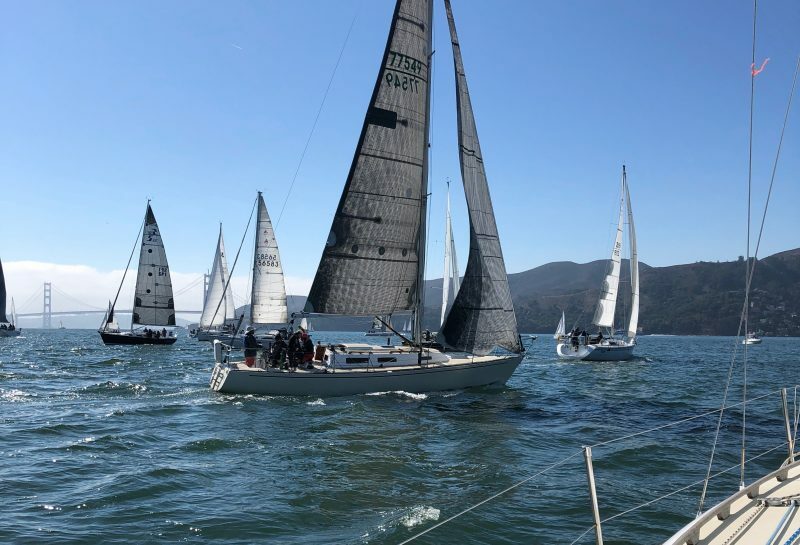 This year’s 13th annual San Francisco Bay event, sponsored by the Corinthian Yacht Club, maintained its title as the top LLS regatta in the country by raising almost $700,000 to support LLS’ efforts to find a cure. The pre-start is always fun with almost 80 boats milling about, waiting for the breeze to fill in. Luckily it did. As often happens this time of year, the race committee postponed while waiting for breeze. Almost 90 racers spread across nine classes hung out in the building ebb. The water finally darkened with a breeze from the Gate and the ebb built, adding another knot to the apparent pressure for first leg. The beautiful classics started first and most racers were sent to Blackaller from the starting line west of Angel Island. For some reason, the race committee decided to have fun with the non-spinnaker 2 class, and sent them into the wind hole off Sausalito — their day nearly ending there. Fortunately, enough light air eventually crept into Richardson Bay to allow the fleet to battle their way out. Seventeen competitively spirited Knarrs were out there, with several boats over early at the ebb-infected start line. The romp around the Bay created close fought battles amongst the tangled course legs and overlapping fleets. The stead breeze held throughout the afternoon letting everyone finish in ample time to enjoy the music, festivities and trophy ceremonies on the CYC sunny CYC deck. Of course awards were handed out for winning boats but also, importantly, for top fund raising boats some of whom raised well over $20,000/boat. The beautiful Royono added beauty to the breeze. If you’ve never raced the Leukemia Cup it’s one that should be on your annual schedule. It should be even if you’ve never raced. It’s a great cause, a great time of year to sail and terrific way to spend a Sunday afternoon in October. And everyone once and a while you get lucky enough to win a race which we managed to do aboard our Ranger 33 Summer Sailstice. We’ll have more on the event in our issue Race Sheet coming out on Thursday, November 1st. The rate of attrition has been high in the around-the-world solo nonstop Golden Globe Race. The latest entry to fall came over the weekend, with the loss of Laaland’s rig some 600 miles southwest of Perth in Western Australia. Frenchman Loïc Lepage reported on Saturday that his mast had broken in two places while he was sailing in 25-knot winds and 10-ft seas. 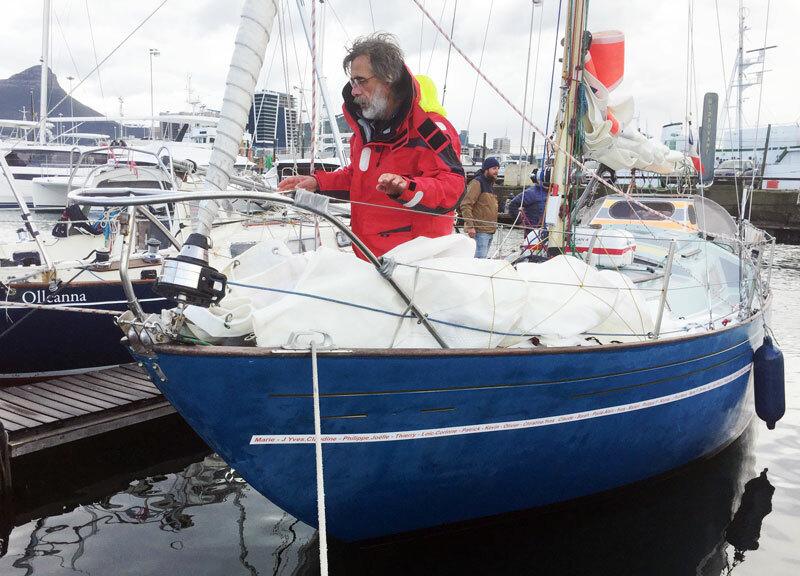 After he cut away the rigging, the highly experienced 62-year-old sailor noted that one section of the mast may have damaged the hull near the keel. He did not ask for assistance and was planning to set up a jury rig at first light on Sunday and sail to Fremantle unassisted. An Australian Maritime Safety Authority RAAF P-8A aircraft overflew Laaland yesterday. That all changed at 18:10 UTC. Lepage made a second call to Race HQ to say his hull was leaking at the rate of 30 liters an hour from an area in the keel hidden from view by a water tank. His pumps were working and keeping up with the flow, but the wind had ramped up to 40 knots. Lepage set off his EPIRB. On Sunday at 01:22 UTC Francis Tolan, the skipper of Alizes II, a Beneteau Ocean 43, offered his assistance. Tolan was positioned some 300 miles northwest of Laaland. Then at 03:14 UTC, the bulk carrier Shiosai, which had been heading west across the Great Australian Bight, also agreed to assist and altered course toward Lepage’s position. Lepage is expected to be evacuated from his dismasted sloop shortly after first light on Tuesday. 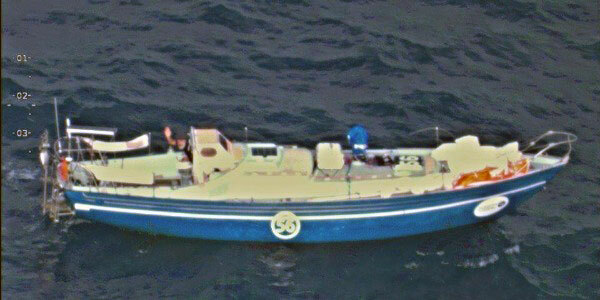 Lepage had to stop in Cape Town, South Africa, to repair the SSB on his Nicholson 32 Mk X and take on fresh water. He was thus relegated to the Chichester Class. Only eight of the original 18 skippers are still racing. For more news, see https://goldengloberace.com. This year’s 23rd Pacific tropical storm has become a Category 5 hurricane, and is expected to make landfall between Mazatlán and Puerto Vallarta tomorrow afternoon. Hurricane Willa “is on track to be one of the strongest hurricanes to ever hit the Pacific coast of Mexico,” according to CNN. Hurricane Willa’s expected track into Mainland Mexico. About 250 miles to the south of Willa is Tropical Storm Vicente, which is expected to make landfall tomorrow evening on the sparsely populated coast of Jalisco. Vicente makes 2018 “the most active hurricane season on record using a measurement called ‘Accumulated Cyclone Energy,’ which combines the number of storms and their intensity through their lifetimes to give an overall measurement of tropical activity in a given region,” according to CNN. Back to the north, Hurricane Willa underwent “astonishing” rapid intensification over the weekend and into today, but is likely to lose strength before making landfall. Puerto Vallarta is, of course, home to numerous marinas and boating interests. The National Hurricane Center is calling Willa “potentially catastrophic,” with threats of torrential rains and major flooding. Willa’s landfall will come three years to the day after Hurricane Patricia made hit Jalisco. Patricia — which had winds of 215 miles per hour and was one of the strongest tropical cyclones ever observed — brought widespread flooding to Central America and rural Mexico. There were an estimated seven fatalities and over $300 million in damage from Patricia, but given that storm’s astounding strength, the damage could have been much more severe. 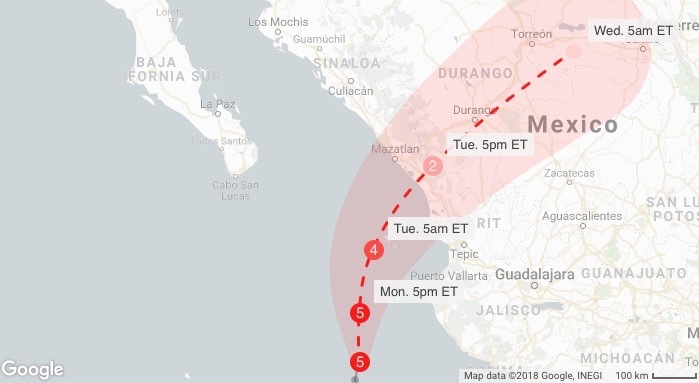 We can only hope that Willa and Vicente will spare Mexico the worst.